Carte de visite of John Wilkes Booth at about the time he was appearing in Rochester. All photos provided by Michael J. Nighan. As seen in The Presidential Visits Series in its entirety: James Monroe to Donald Trump, Michael J. Nighan offered meticulously researched and colorfully narrated accounts of eight presidential visits. Today, in a twist in the series, Nighan looks at a presidential assassin. Once again, he delves deeply into the archives of the Rochester Public library and beyond, including discovering a remarkable historical coincidence. Johnny Booth was a handsome devil, Got up in his rings and fancy silks. Had him a temper but kept it level. Everybody called him Wilkes. Lincoln, Garfield, McKinley, Kennedy. Four presidents. Four victims of an assassin’s bullet. 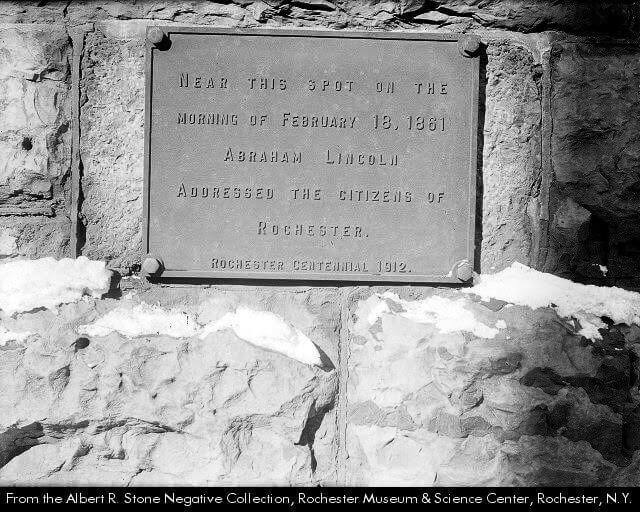 And all four visited Rochester. As did three of the assassins; John Wilkes Booth, Garfield’s assassin Charles J. Guiteau, and Leon Czolgosz, who shot McKinley. This article targets Booth. Booth’s Rochester connection took place in early 1861. The 22-year old actor (Wilkes to his friends and to the theater-going public), had had a rocky start to his career. Unavoidably compared, usually unfavorably, to his brother Edwin, and known more for the energy of his performances and his penchant for scene stealing than for the quality of his dramatic interpretations, Booth had nevertheless spent the last five years working his way up to be a headliner, and a heart throb for the female members of his audience. Indeed, by 1861, it’s been estimated he was earning the equivalent of a half million dollars a year in today’s money. Having recently performed in such major venues as Boston, New York, Chicago, Cleveland, New Orleans and St. Louis; as one-by-one states of the no-longer United States had begun seceding, Booth was acting at the New Gayety Theater in Albany, the leading man in various Shakespearean productions as Romeo and Juliet, Othello, and Richard III, and in such now-forgotten potboilers as The Apostate, The Marble Heart and Evadne. Having grown tired of the constant travel necessitated by one or two night performances, Booth had agreed to a four month contract at the Gayety, to be interrupted by a two week stint at the Metropolitan Theatre in Rochester starting in late January. Subsequently, perhaps as a move to pacify local blue stockings who still viewed theaters as the devil’s workshop, The Metropolitan’s owners took advantage of the social reform movement sweeping the country to present one of the ubiquitous road show productions of “Uncle Tom’s Cabin” (then playing in literally every city and town across the North), followed by, “Women’s Rights of 1853”, a play based on the recent convention at Seneca Falls. 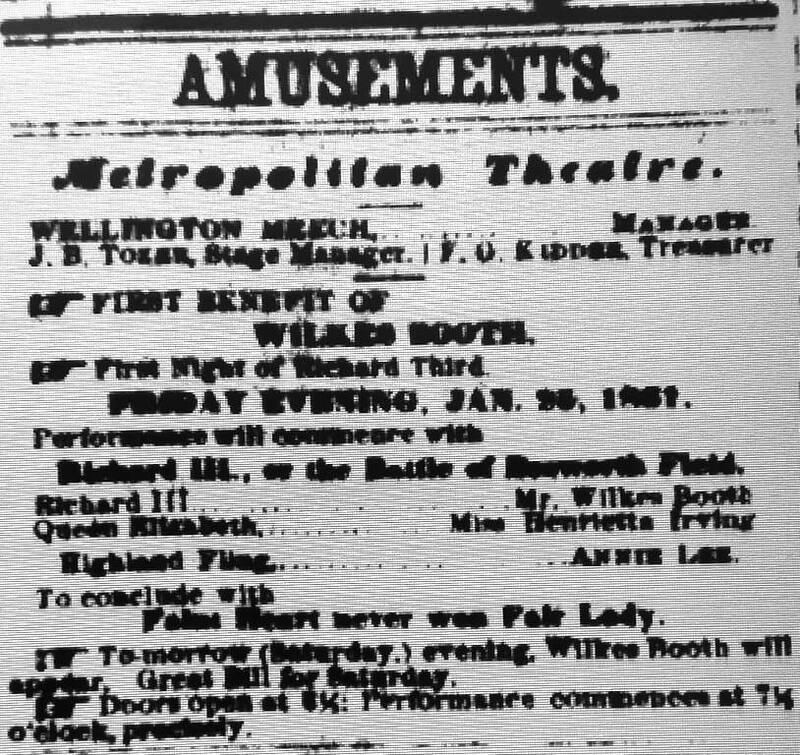 In the following years many of the leading performers of the day (including in 1857 John Wilkes’ elder brother Edwin*) “trod the boards” at The Metropolitan. So it came as no surprise when manager Wellington Meech signed up the rising star Wilkes Booth, to perform in Shakespeare and other assorted Victorian-era favorites. Despite suffering from a severe cold during most of his run, Booth won rave reviews for his performances. 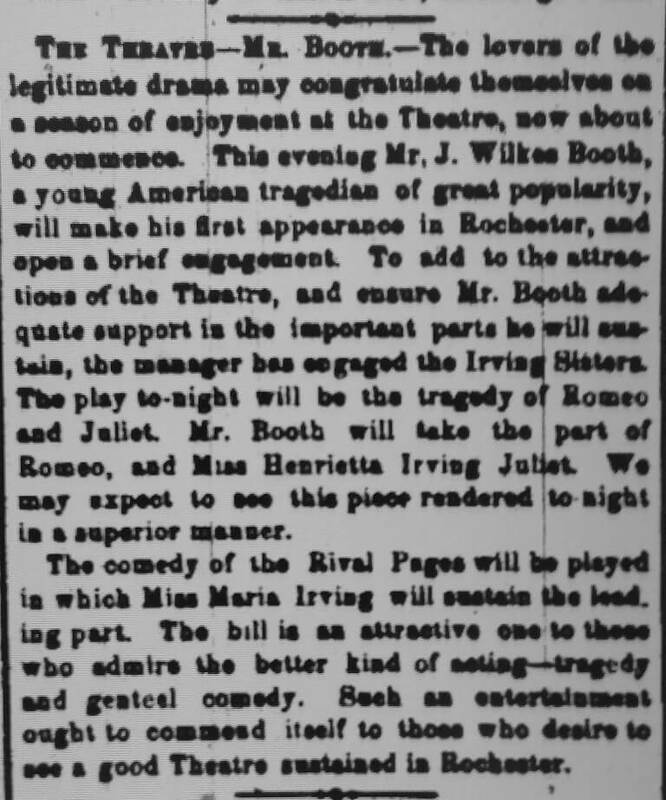 “The distinguished actor Mr. Booth has been honored with good houses since he commenced his engagement and has won golden opinions” claimed the Union and Advertiser, with the Rochester Evening Express calling him, “the most talented young man upon the American stage”. A bit of humor popped up in this otherwise serious drama when the actor playing the Duke of Norfolk missed his cue, entered from the wrong side of the stage and walked up behind Booth. Looking the other way, Booth suddenly realized in the middle of his line what had happened, whirled around and said, “What thinks thou Norfolk….and why the devil didn’t you come in on the other side !” According to newspaper accounts, the audience shook with laughter for five minutes. Less humorous was an incident in the second performance when, engaged in one of his trade mark overly-enthusiastic sword fights, Booth slipped and stabbed an actor above the eye with his wooden sword, breaking off the point of the weapon and causing a serious injury. 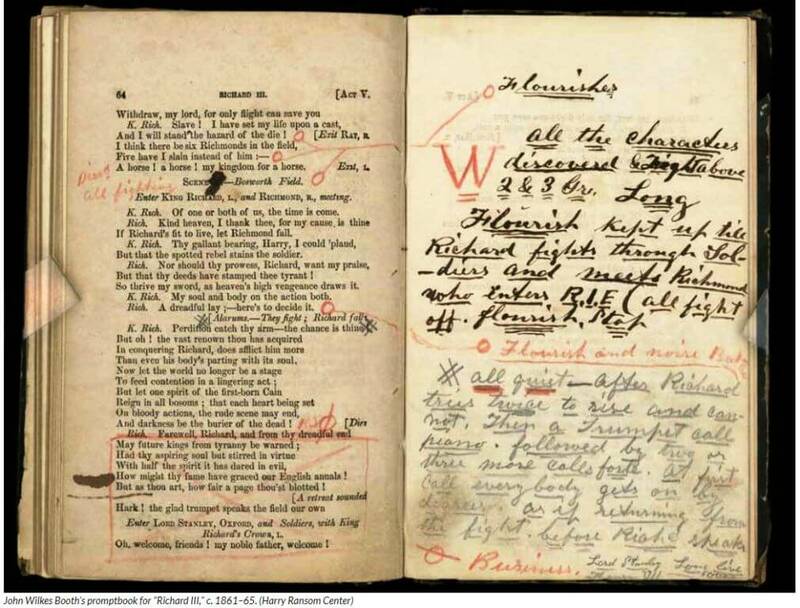 Prompt book for Richard III with JWB’s handwritten notes. Leaving Rochester following their last performance on February 2, Booth and the Irving sisters journeyed back to Albany where, after a few days rest, he returned to the stage of the Gayety Theatre where he played on and off for the next two months. At this point, some weird historical coincidences began to pile up. While Booth was leaving Rochester in February, Abraham Lincoln was packing his bags in Springfield, Illinois for his train trip to Washington and his inauguration. On Feb. 18, after leaving Buffalo, and following a very short stop in Rochester, Lincoln and his family arrived in Albany in the afternoon where he was officially greeted by a number of dignitaries, including U.S. Senator-Elect Ira Harris (more on him in a minute). A procession of carriages escorted Lincoln to the capitol building where he addressed the state legislature. The trip took Lincoln past Stanwix Hall, John Wilkes Booth’s hotel. Booth had spent the past few days in the hotel bar, drinking, recovering from his self-inflicted wound, and expressing his low opinion of Lincoln and the Republicans to anyone who would listen. So vehement had he become that the book keeper of the Gayety Theatre had warned him that he was harming his reputation (and the theatre’s receipts). It’s probable that Booth was in the Stanwix bar when Lincoln passed by and may even have watched him pass. At the very least, we know that Lincoln and Booth were in close proximity. But it got weirder, much weirder. There were five people in Lincoln’s box at Ford’s Theatre on the fateful night of April 14, 1865. Lincoln, Mary Todd Lincoln, Major Henry Rathbone, his fiancée Clara Harris (#), and of course John Wilkes Booth. Clara Harris was the daughter of the above-mentioned Ira Harris. Henry Rathbone was Ira Harris’ step-son and was practicing law in Albany at the time. On Feb. 18, 1861, while Lincoln and his wife were driving past Booth’s hotel, accompanied by Sen. Harris, Clara and Henry were spectators at the welcoming ceremonies. In other words, four years before they would be collectively involved in America’s greatest tragedy, all five participants were together in the same place at the same time! This was a real chore. The local history division at Rundel had no record of any photo or drawing of the Metropolitan. 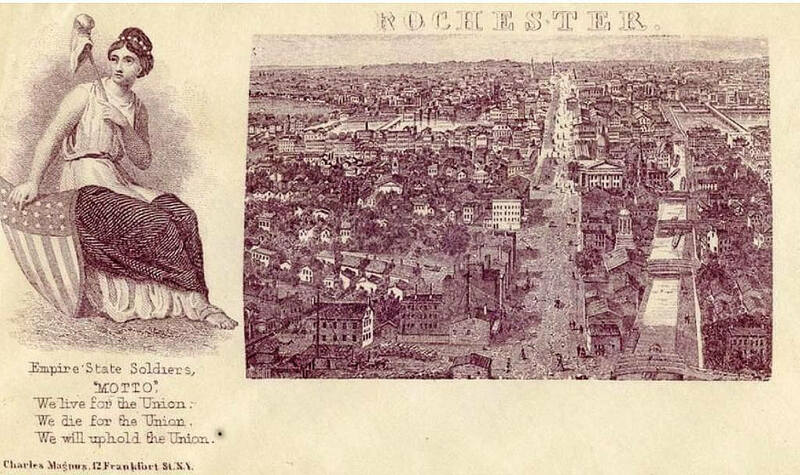 I kept digging and found a reference to a bird’s eye view of Rochester from 1867-68. Turns out it was a lithograph and only a single copy proof (4 ft. by 7 ft. in size) exists, locked away in the archives at Genesee Country Museum. 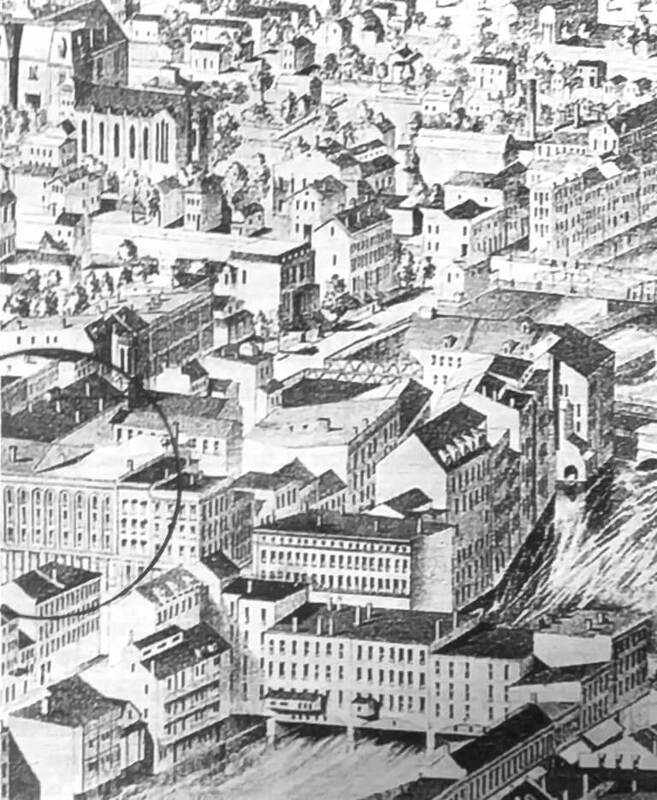 Unfortunately, although a small section of it was reproduced in a 1975 issue of Rochester History magazine, which by coincidence almost shows all the buildings, including the theater, around the intersection where the theater stood, the local history division at Rundel doesn’t have a copy of the entire lithograph. That’s the one I copied with a circle drawn around the edge of the intersection where the theater probably was located. Today it’s the site of the convention center….or maybe the parking garage across the street. 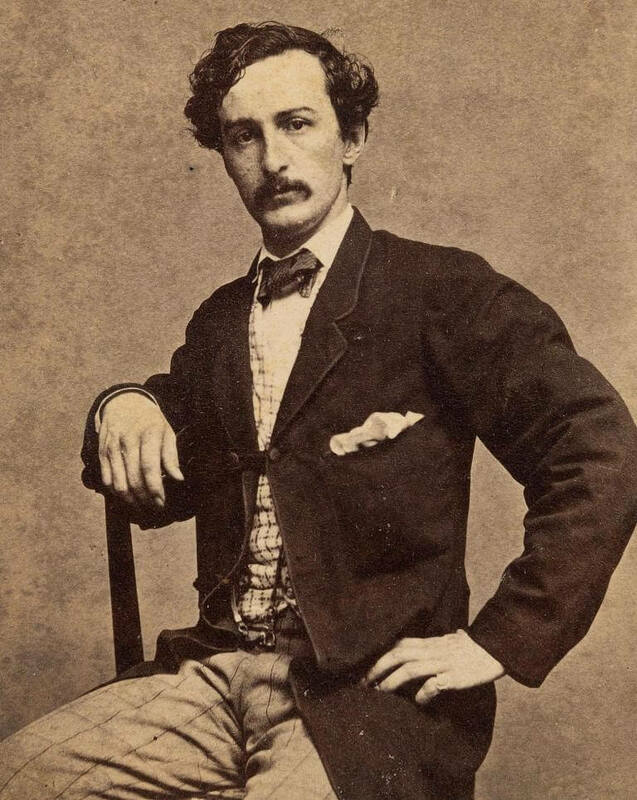 (*) On April 3, 1889, in a return visit to Rochester in the role of Iago in Othello, Edwin Booth suffered a mini-stroke soon after walking on stage. Believing that Booth was dying, it was announced that, “We fear that this is the beginning of the end. The world may have heard for the last time the voice of the greatest actor who speaks the English language.” Although the dire reports proved to be premature, Booth never fully recovered and ultimately died of another stroke in 1893. (#) The subsequent marriage of these step-siblings tragically ended in the murder of Clara, and the attempted murder of their children, by a deranged Henry, who would spend the last 27 years of his life in an insane asylum.